December 17, 2016 by The Junkie 3 comments on "How to Get Hebrew Word of the Day & Why This Method’s Powerful"
Good news – HebrewPod101 sends free daily word lessons to your email. What is HebrewPod101? It’s just a popular online Hebrew learning course/site. And it offers this as a free feature. So every day, in your email inbox, you get 1 new lesson. To get the Hebrew word of the day, you just need to sign up to their learning program. Just requires an email and your learning level. It’s free overall (though there are paid subscriptions they sell) so nothing is needed of you. It takes 2 seconds. 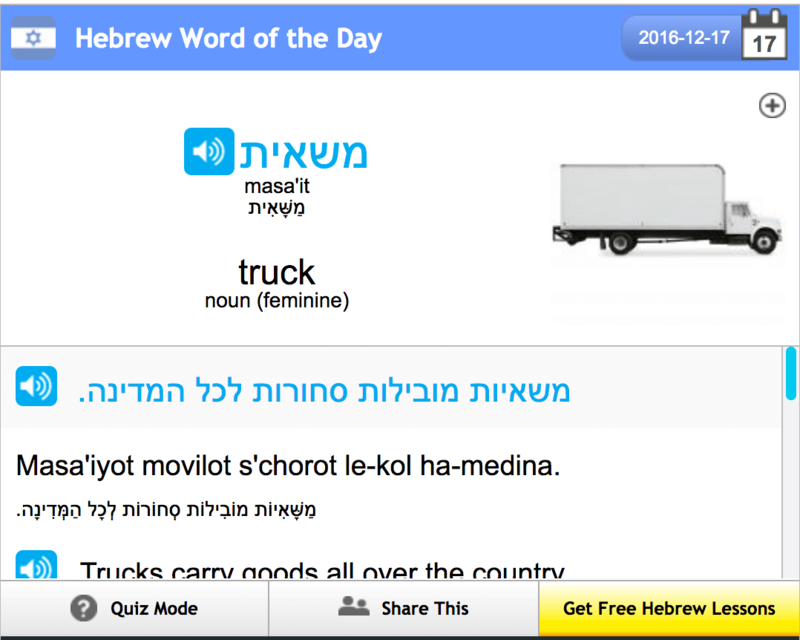 On the second screen, you can sign up for the free Hebrew word of the day email lessons. That’s it. If you want to check out the rest of their learning program – go for it – but this is article is purely about the daily word lessons. Done! Let’s answer the first question. You’re thinking: it’s 1 tiny word of the day… Not enough to make a dent, right? Pay attention: despite it being “1 tiny word a day,” this method of learning allows you to succeed. It’s easy enough to start, to continue and to form a rock-solid unbreakable learning habit. A. You Build A Habit: Take a look at any veiny-muscled gym addict. At any smooth, fluid dancer. At any 6AM jogger that runs daily without hesitation. And also, take a look at anyone that eats burgers daily (they’re fat). All of these people are ruled by habits. The habit of exercising, practicing dance, waking up early (all good habits) and eating bad food (bad habit). You too are ruled by habits. Take a look at your daily life and you’ll spot patterns. B. It’s Easy to Start – Which is Crucial for Habits. Learning 1 measly word a day is EASY. Takes 1 second! And because it’s easy to start and easy to do… it’s easy to continue. Think about it. How many habits did you FAIL at? I bet mostly because they were too hard. For example, people buy textbooks to learn…and then leave them under the bed. Why? No learning habits… and the book wasn’t exactly an easy start. Point is, if it’s easy to do, it’s easy to continue. Which brings us to the 3rd point. C. It Keeps You Going – Which is Crucial for Habits. The great thing about HebrewPod101‘s Hebrew Word of the Day is – it comes daily. his is good for motivation. This is even better for keeping you at it. And as such, you’re more likely to succeed. Success comes from continuing and keeping at it. So why do “smart” people make the mistake of ignoring this learning method? They ignore this learning method because it’s so easy. It feels like it won’t make a dent in your learning progress. But stop, go back above and re-read as to why it’s powerful. You build rock-solid learning habits that will carry you to fluency. Now, what’s more important is… because you realize how easy learning 1 Hebrew word a day is… you realize you CAN and WANT to learn more. 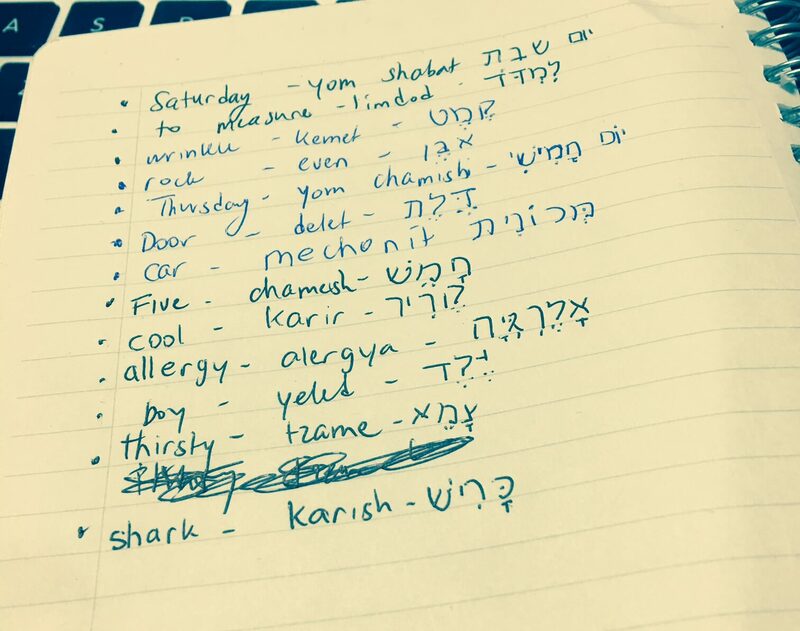 And that’s where your habits start growing and your Hebrew gets even better. All because of 1 measly word of the day. Crazy, huh? Get a notebook: write down the words & meanings on a daily basis (I do this – see picture below). Speak: Play the audio pronunciation and read/repeat the word out loud. Add the words to flashcards (digital or physical) so you can review them later. Memorize: Repeat the word about 20 times that day so you can remember it. Start a google document or excel file and save all of the new words there. Read the sample sentences to get a better understanding of the word. And that’s it. Wait, how do you use the Hebrew word of the day? Leave a comment. I read them all. Thank you for info, was just searching something like this to expand my vocabulary.